Katherine Bryan made her concerto debut at the age of 15 with Daniel Harding and the Academy of St. Martin-in-the-Fields in London and later made her US concerto debut at the Lincoln Centre with the Julliard Orchestra. She has since performed as soloist with the Helsinki Philharmonic, Royal Scottish National, Halle, Nurnberger Symphoniker, New York Philharmonic and English Baroque orchestras. Katherine\’s debut solo recording of the Nielsen and Liebermann Concertos, Poulenc Sonata (orch Berkeley) and Hue Fantasie with the Royal Scottish National Orchestra conducted by Paul Daniel, was released to great acclaim in September 2010. Further to this success, Katherine released a disc of American Concertos in May 2013, including works by Ibert, Martin and Rouse, which was celebrated by a launch at National Geographic London Store as part of the Cultural Calendar. Katherine\’s recording of the Rouse Concerto is the first ever British recording which she discusses with Gramophone Magazine. 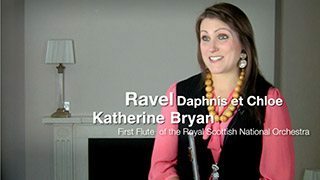 A winner of the prestigious Audi Music Competition at the age of 15, Ms. Bryan initially studied at Chetham School of Music, Manchester and won a full scholarship to study flute at the Julliard School of Music, New York with Jeanne Baxtresser and Carol Wincenc where she won the four-yearly flute concerto competition. She was also a prize winner at the Royal Overseas League Music Competition in London, the Young Concert Artists International Competition in New York and was a finalist in the BBC Young Musician of the Year for three consecutive competitions. She was awarded the Julius Isserlis Scholarship by the Royal Philharmonic Society. Ms Bryan spent the summers of 2001 and 2002 in Japan with the Pacific Music Festival Orchestra working with conductors including Charles Dutoit. 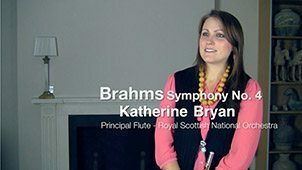 At the age of just 21, Ms Bryan was appointed principal flute with the Royal Scottish National Orchestra – a position she holds today in addition to appearing as concerto soloist with leading orchestras worldwide. She is currently a lecturer in flute at the Royal Scottish Academy of Music and Drama and has played as Guest Principal with the London Philharmonic, BBC Scottish, Scottish Chamber, Royal Philharmonic, Northern Sinfonia, Halle, Philharmonia and London Symphony orchestras. Ms Bryan has appeared at major international festivals as both concerto soloist and recitalist, including the Cheltenham International Festival. She has given live broadcasts on Classic FM, BBC Radio 3 and on BBC television.